The traditional technique of casting ingots is a batch procedure. Every ingot is stripped from its mould after solidification and processed individually. Moreover the defects like piping and micro-structural and chemical variations are present throughout the ingot. These problems are alleviated throughout continuous casting process that produce better quality steels. Uninterrupted or strand casting was first improved for casting non-ferrous metal strip. The process is now employed for steel production, along with major efficiency and productivity improvements and important cost decrease. A system for continuous casting is represented in following figure. The molten metal in the ladle is cleaned and nitrogen gas via it is blown for five to ten minutes to equalize the temperature. The metal is then poured into refractory-lines intermediate pouring vessel termed as tundish where impurities are skimmed off. The tundish can hold as more as three tons of metal. The molten metal vessels via water-cooled copper mould and begin to solidify as it travels downward along a part supported by rollers. Before beginning the casting process, dummy, or a solid starter, bar is inserted in the bottom of the mould. 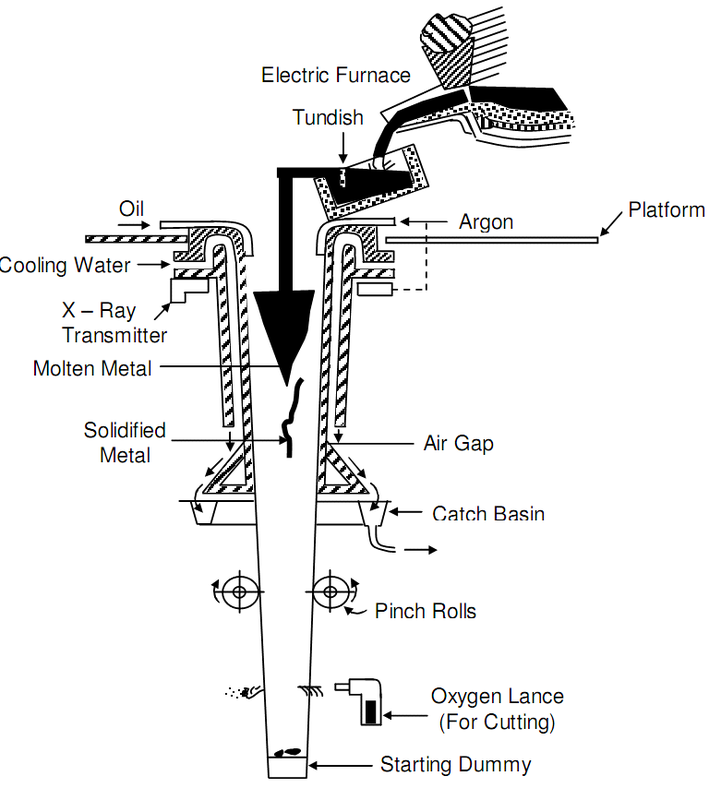 The molten metal is after that poured and freezes onto the dummy bar as in following figure. The bar is withdrawn at the similar rate the metal is poured. The cooling rate is such as the metal develops a solidified skin to hold itself during its travel downward at speed maintained at 25 millimeter per second. The shell thickness at the exit end of the mould is about 12 to 18 millimeter. Additional cooling is provided throughout water sprays beside the travel path of the solidifying metal. The moulds are normally coated along with graphite or similar solid lubricants to decreased friction and adhesion at the mould walls. Moulds vibration may further decrees friction and adhesion tendency. Wire nails and wire mesh, tubes and pipes. Strips, Plates and extra cold rolled for reducing thickness.